Colorfalls Water Features - New England Silica, Inc. Carry the beauty of water deep into the evening with Atlantic’s Colorfalls, the first lighted weir specifically designed for water features. Our newest models continue to lead the industry in appearance and functionality. Available in solid colors, color changing, and now in four different sizes, Colorfalls will add a simple, elegant beauty to your outdoor space, day and night. Basin dimensions that work with popular retaining walls and paving stones for easy installation with minimal cutting. Built-in plumbing recesses that enable all plumbing to be installed within the dimensions of the basin, eliminating the need to make any cuts in the block. A pump chamber, separated from the rest of the basin by a Matala filter mat that diffuses water turbulence, eliminates bubbles, and allows more light to travel through the falls. 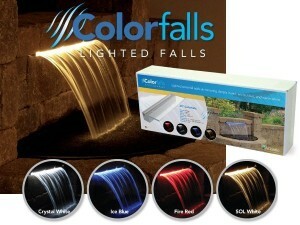 A new Colorfalls weir that allows complete access to the internal components, incredible strength, unmatched light output, the most color choices, side inlets that allow the plumbing to be concealed within the wall, and the ability to join multiple Colorfalls together to form one large, sheer fall. Atlantic’s Colorfalls System is not the best by accident; it’s the best by design.